Rosemary Cyriac is a doctoral student in the Department of Civil, Construction, and Environmental Engineering at NC State University. She has studied numerical models for coastal ocean circulation with her adviser, Casey Dietrich, who leads NC State’s Coastal & Computational Hydraulics Team. Editor’s Note: May 13 to May 19 is the 2018 North Carolina Hurricane Preparedness Week. Each day follows a different topic. The following post relates to Monday’s theme: storm surge and evacuation plans. As a new Atlantic or Gulf hurricane forms offshore, there’s typically speculation about its eventual landfall location and strength, and how the storm will affect surge and coastal flooding. 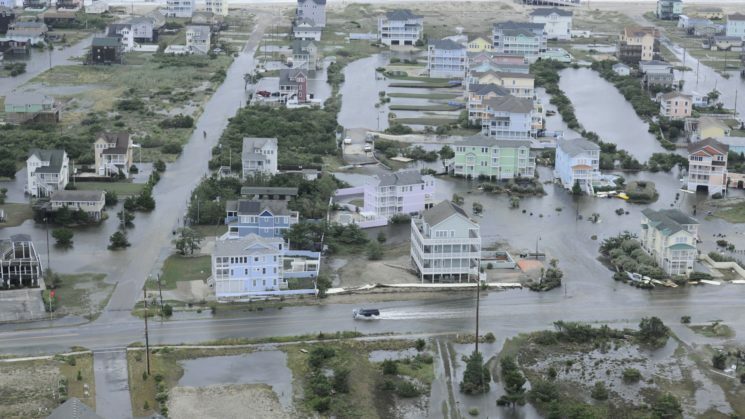 In a study published recently in Coastal Engineering, we explore these questions by examining the forecast predictions during Hurricane Arthur, a Category 2 hurricane that made landfall along the North Carolina coast in early July 2014. The research was funded by North Carolina Sea Grant, the Gulf of Mexico Research Initiative and the U.S. Department of Homeland Security through its Coastal Resilience Center of Excellence. To analyze these questions, we modeled the actual wind data archived after Arthur to develop a “hindcast,” which served as a “true” representation of the storm’s wind and surge impacts along the N.C. coastline. We then compared that hindcast with the wind and surge predictions our model had produced based on the consensus forecast advisories issued by the National Hurricane Center (NHC) during the event. For Arthur, the NHC forecasts changed significantly during the two days before the storm’s initial landfall in North Carolina. For most of the forecast advisories, the storm was projected to remain offshore, with a track that moved northeastward off the Outer Banks. The forecast track later shifted westward. 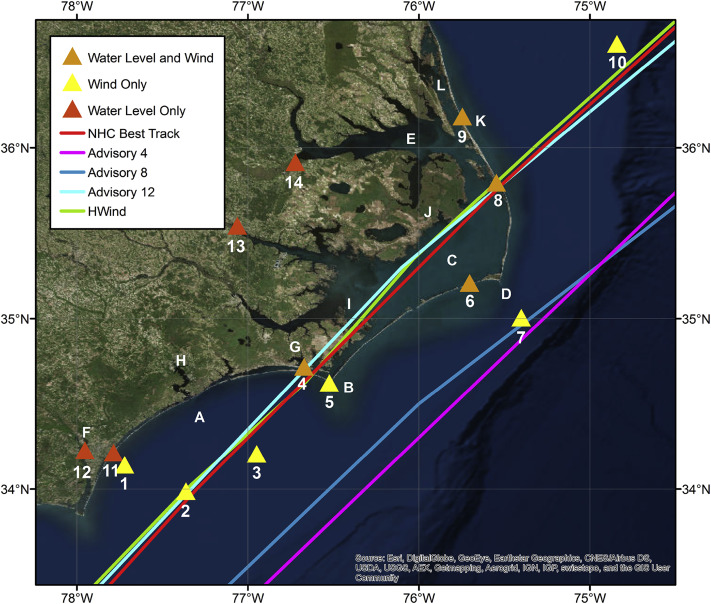 By Advisory 10, issued at 5 a.m. EDT on July 3, 2014 — about 18 hours before the storm made landfall — the storm was projected to move over Cape Hatteras. Observation stations used for model validations (indicated by numbers) and other important geographic locations along the N.C. coast (indicated by alphabet letters); a key is provided in the Coastal Engineering article. Lines indicate storm track predictions during Advisories 4 (pink), 8 (blue) and 12 (cyan) respectively issued by the National Hurricane Center 54, 30 and 12 hours before Arthur made landfall along the N.C. coast. “True” tracks from post-storm analyses also are shown (red and green). However, successive advisories also were predicting an increase in the storm’s strength, which is defined as the power available in the storm winds to push the waves and surge. The storm was predicted to be stronger by more than 50 percent, compared to what actually occurred. In other words, the forecasts had the correct landfall location, but those same forecasts over-predicted the storm strength. Due to these errors in the storm’s consensus forecast track and strength, subsequent errors associated with the predicted wind speeds and water levels also increased during Advisories 4 through 12 in the three days that Arthur approached landfall. We wanted to know how each of these trends had affected our wind and surge predictions. As the forecast track improved, our predictions should also have improved. But as the forecast strength got worse, our predictions may also have gotten worse. To test our hypotheses, we considered these scenarios independently, using our hindcast data. In a “constant track” analysis, we used Arthur’s true track but kept the original strength forecasts. This approach allowed us to see the effects of the strength forecasts on our surge predictions. In a separate “constant storm strength” analysis, we used Arthur’s true strength retained the original track forecasts. This way, we could determine the effects of the track forecasts on our surge predictions. Overall, we found that as errors increased in storm strength forecasts, errors in wind speed predictions significantly increased. Meanwhile, as track forecasts aligned with the storm’s true path, errors in wind speed predictions significantly decreased. For both analyses, predictions related to water levels — a measure of surge — remained relatively consistent compared to observations at NOAA gauges. Specifically, accuracy in water level predictions improved as forecasts of the storm’s track also improved. As forecasts predicted a stronger storm than what actually occurred, however, the accuracy of water level predictions slightly worsened. The water-level errors responded nonlinearly, with only a late improvement when the track became “correct,” and only a slight worsening as the storm became too powerful. Although this study is specific to Arthur, it demonstrates the challenges in predicting wind speeds and surge levels. As an Atlantic hurricane moves toward the N.C. coastline, it is important for many groups to be prepared for devastating winds and flooding. Forecasters should continue to investigate and quantify how uncertainties in the forecast storm parameters will translate into prediction errors for wind speeds and surge. The associated risks of potential variations in storm behavior must be communicated appropriately to emergency managers and other local officials, who make decisions to keep residents safe. To that end, we have shared these research findings in informal discussions with decision-makers at N.C. Emergency Management, and we will continue to improve our predictions for stakeholders in North Carolina.